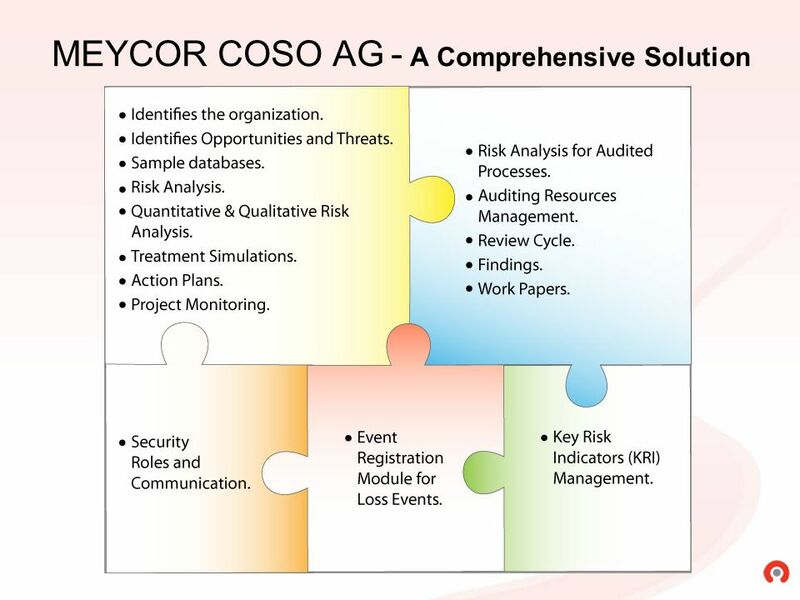 5 MEYCOR COSO AG Meycor COSO AG includes several activities to be assigned to the parties involved in the Risk Management process and a methodology project to provide a step-by-step guide. 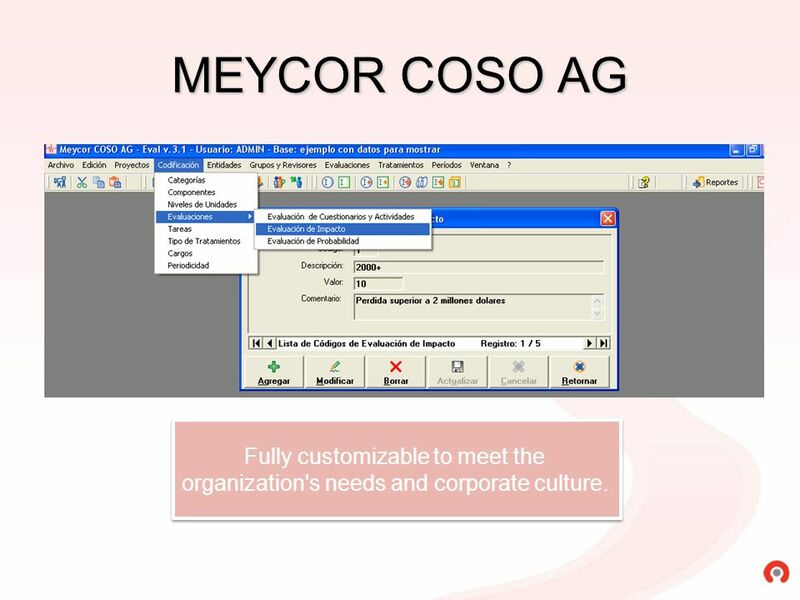 organization's needs and corporate culture. 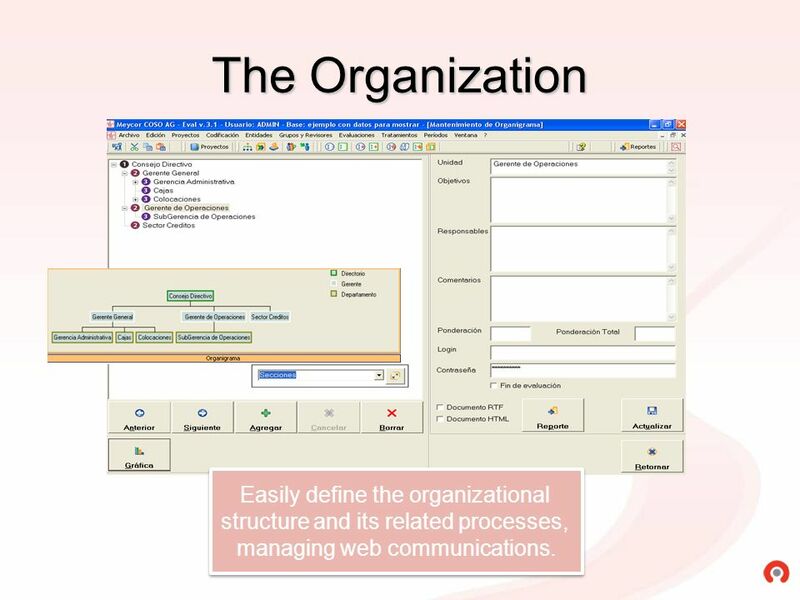 structure and its related processes, managing web communications. 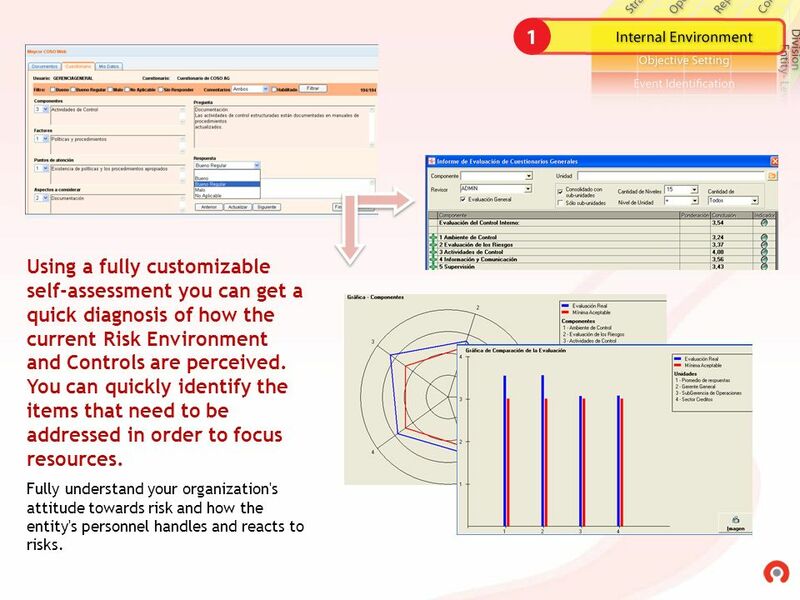 8 Using a fully customizable self-assessment you can get a quick diagnosis of how the current Risk Environment and Controls are perceived. You can quickly identify the items that need to be addressed in order to focus resources. 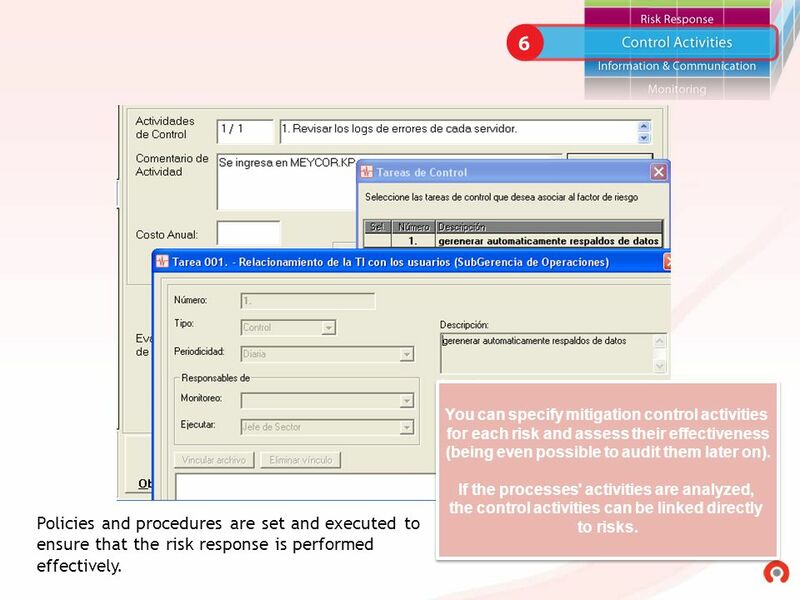 Fully understand your organization's attitude towards risk and how the entity's personnel handles and reacts to risks. process, classifying and assigning them importance ratings. Strategic objectives can be traced to the highest organizational level. 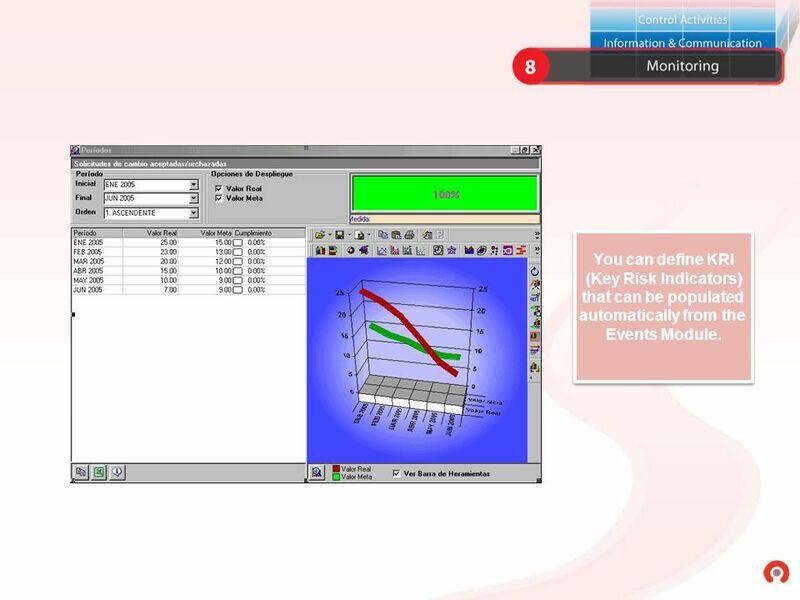 You can even define a different risk threshold for each objective. 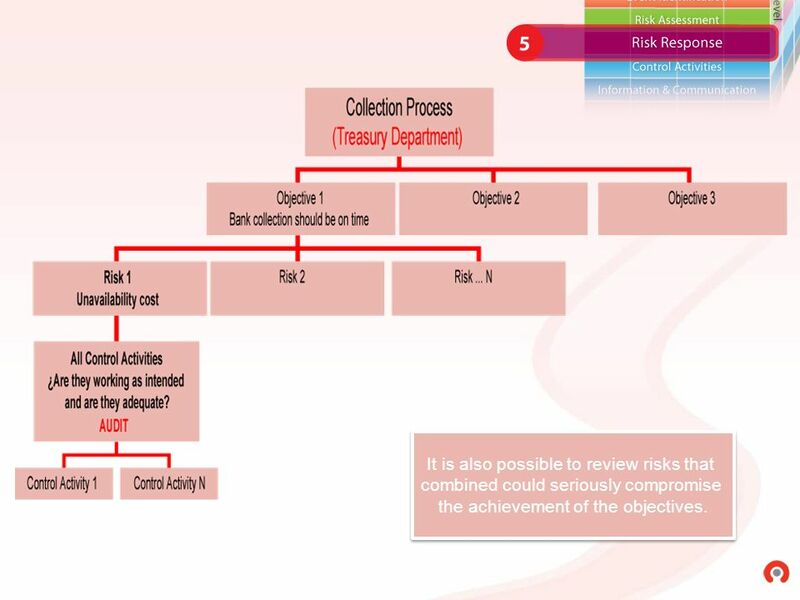 Enterprise Risk Management ensures that Senior Management has a process in place to establish objectives and that the objectives thus selected contribute to the entity's mission. 10 with the collaboration of all the areas involved. Events are identified with the collaboration of all the areas involved. 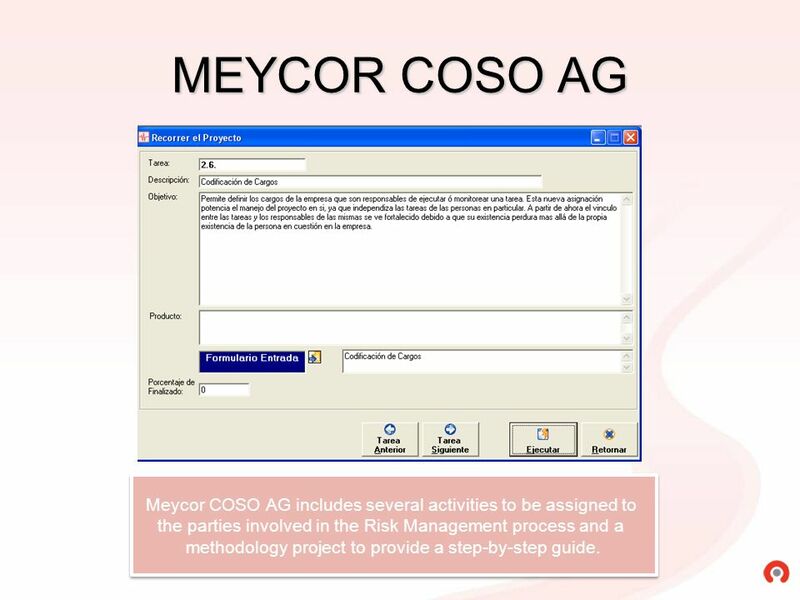 Meycor COSO AG includes a sample event database for common processes. 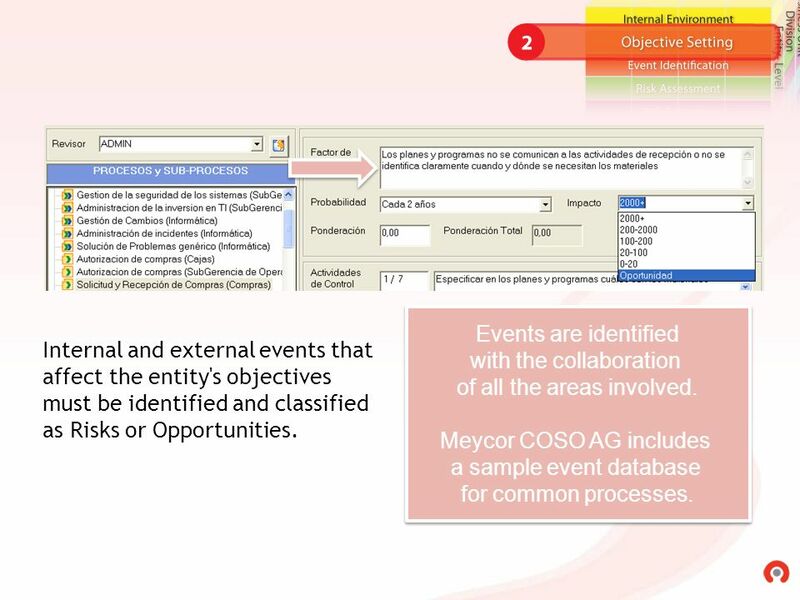 Internal and external events that affect the entity's objectives must be identified and classified as Risks or Opportunities. You can estimate their likelihood of occurrence and consequences. Risks are analyzed considering their likelihood and impact in order to determine how they should be managed. 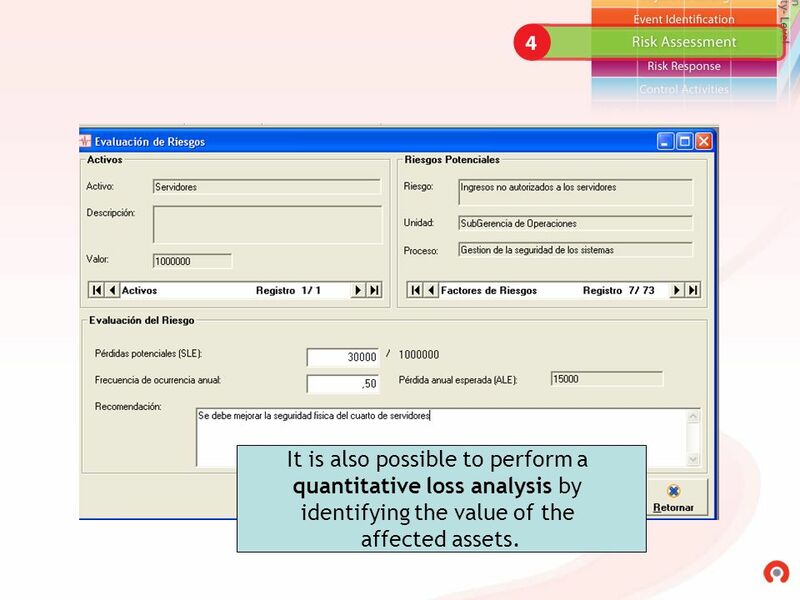 identifying the value of the affected assets. acceptable level set by the organization. 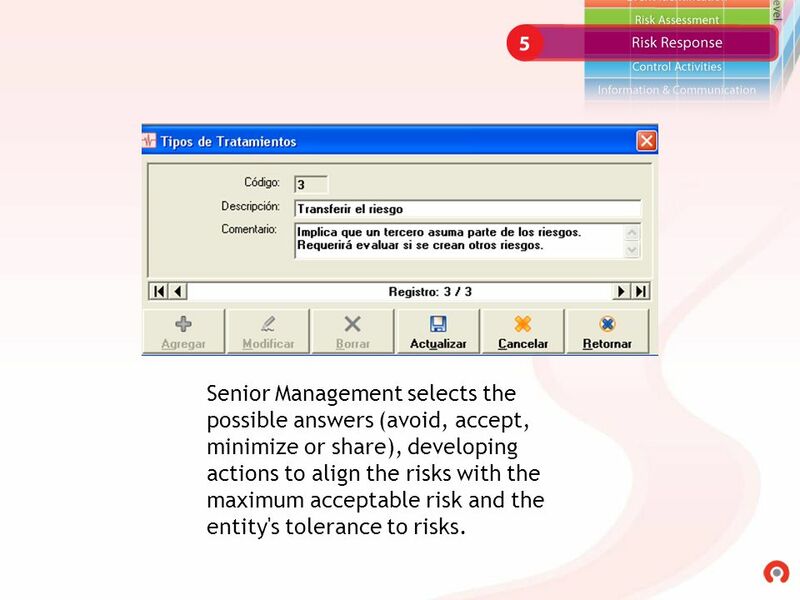 14 Senior Management selects the possible answers (avoid, accept, minimize or share), developing actions to align the risks with the maximum acceptable risk and the entity's tolerance to risks. combined could seriously compromise the achievement of the objectives. 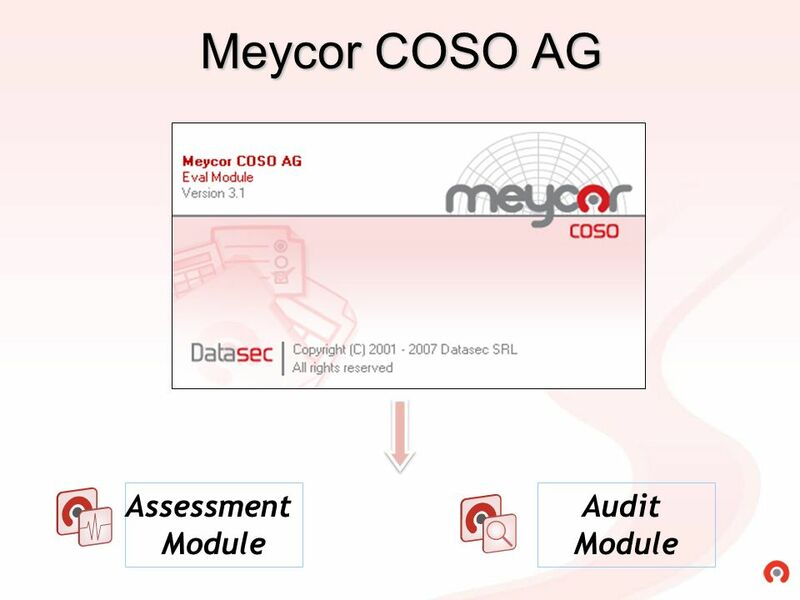 for each risk and assess their effectiveness (being even possible to audit them later on). 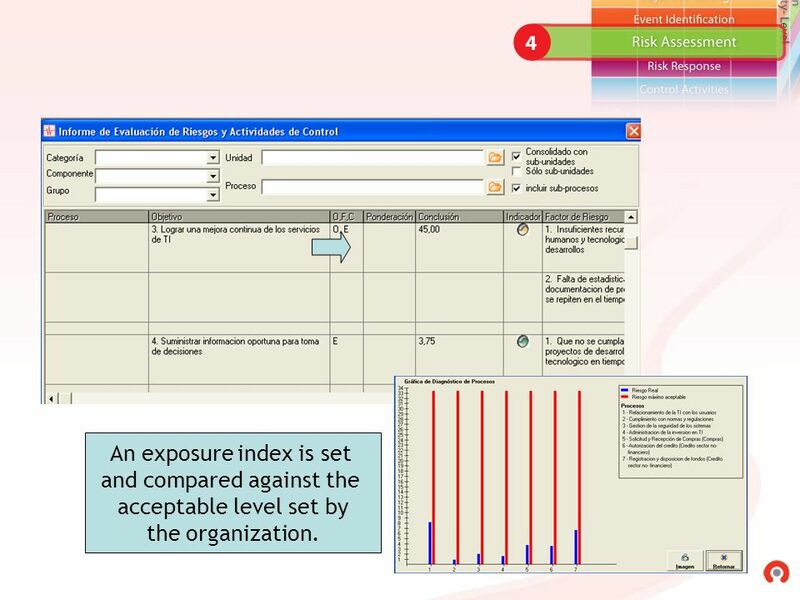 If the processes' activities are analyzed, the control activities can be linked directly to risks. Policies and procedures are set and executed to ensure that the risk response is performed effectively. 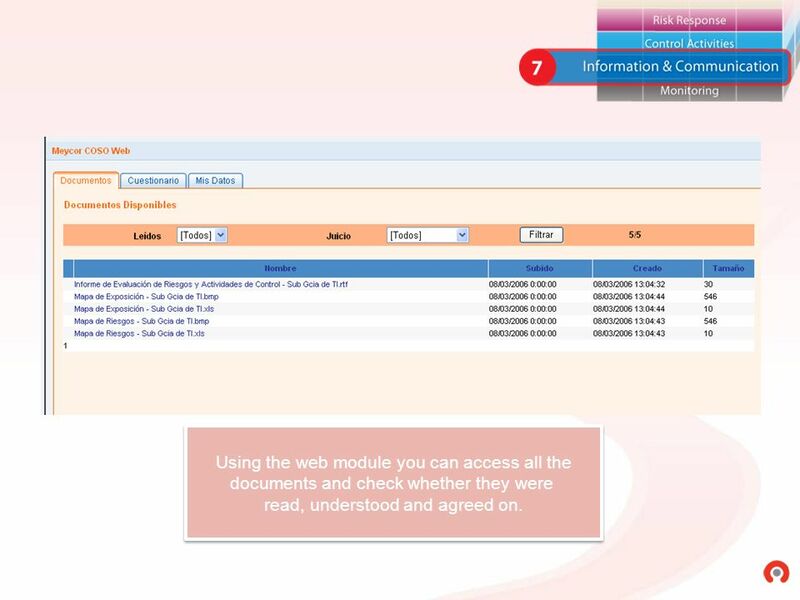 All relevant information is identified, captured and communicated timely and accurately in order to enable the staff to take on full accountability. An effective communication needs feasible channels throughout the entity. 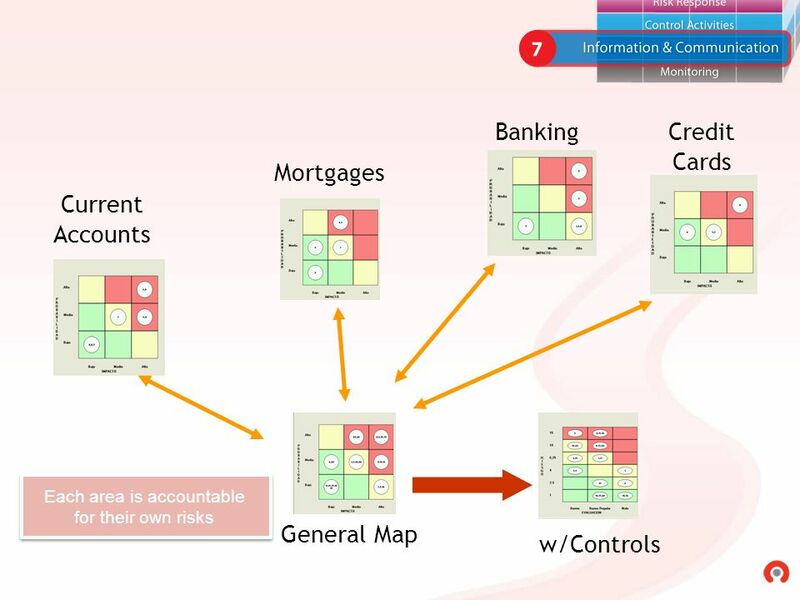 Risk Maps and Reports are published in such way that each area must take responsibility for their risks. 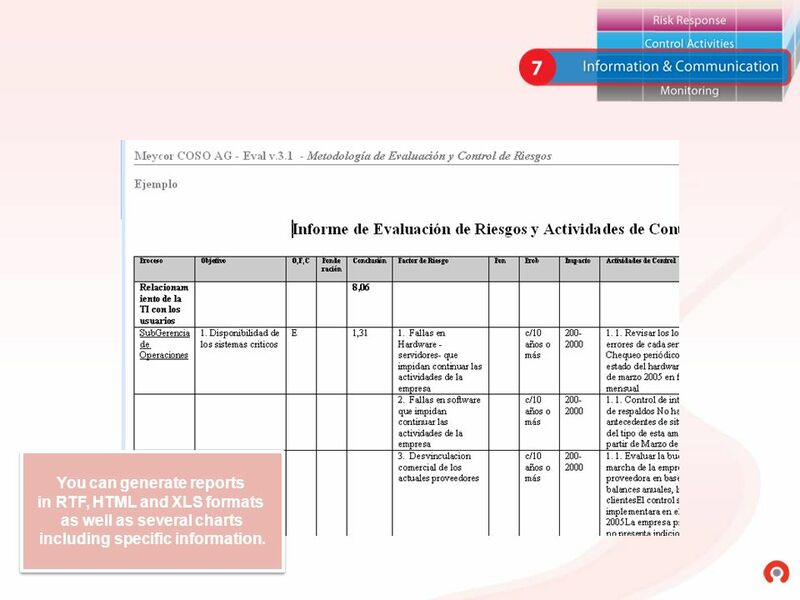 documents and check whether they were read, understood and agreed on. as well as several charts including specific information. 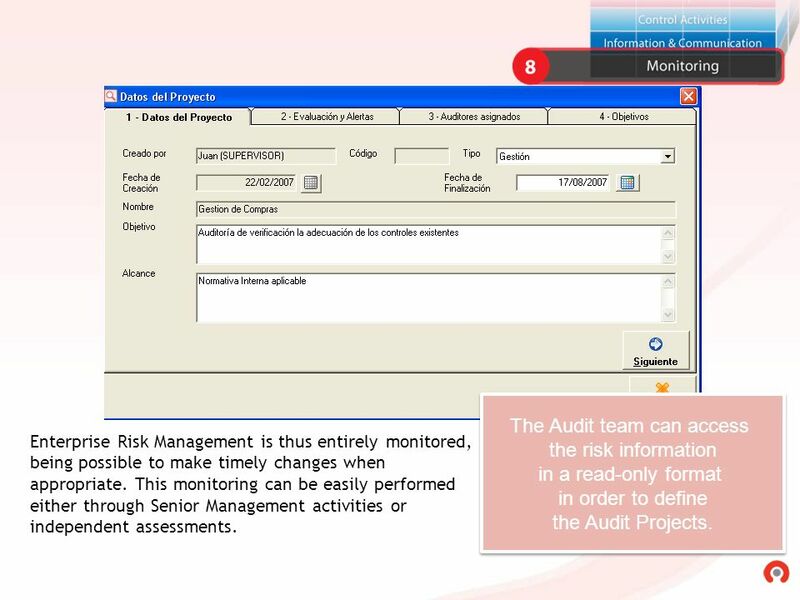 the risk information in a read-only format in order to define the Audit Projects. Enterprise Risk Management is thus entirely monitored, being possible to make timely changes when appropriate. 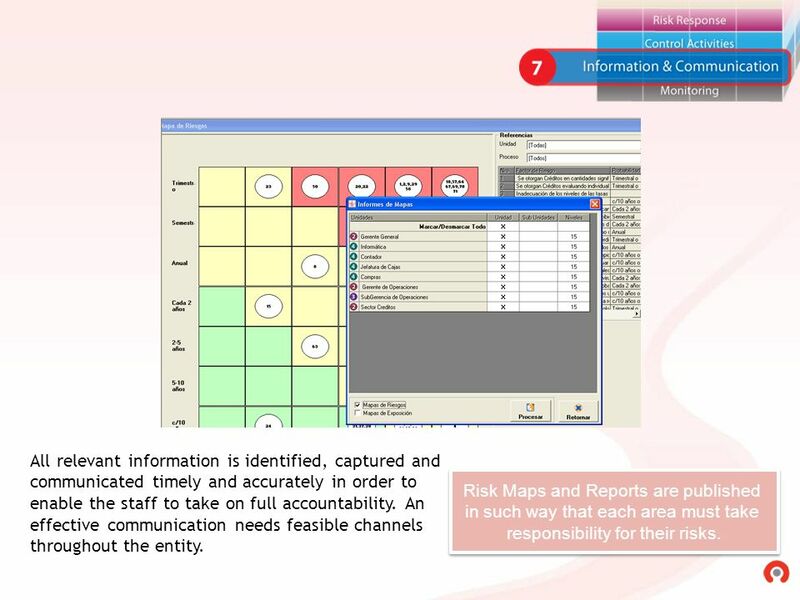 This monitoring can be easily performed either through Senior Management activities or independent assessments. 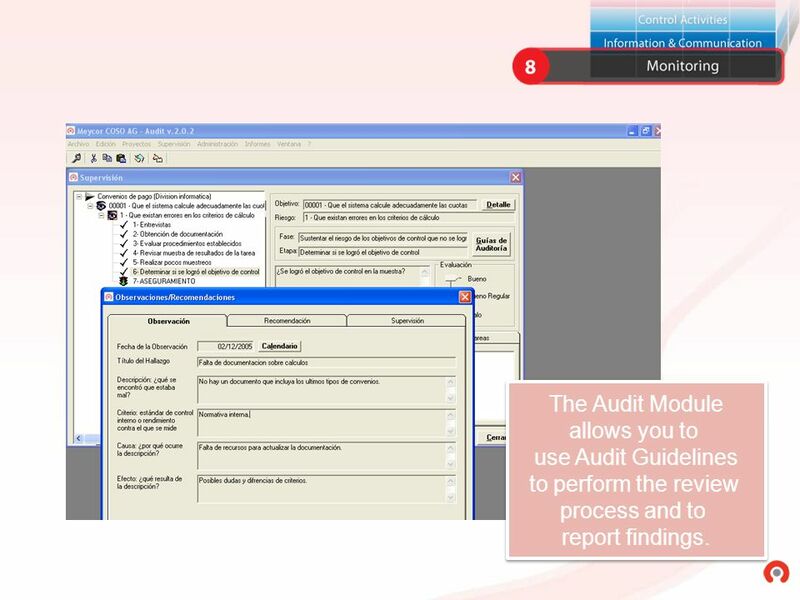 23 The Audit Module allows you to use Audit Guidelines to perform the review process and to report findings. 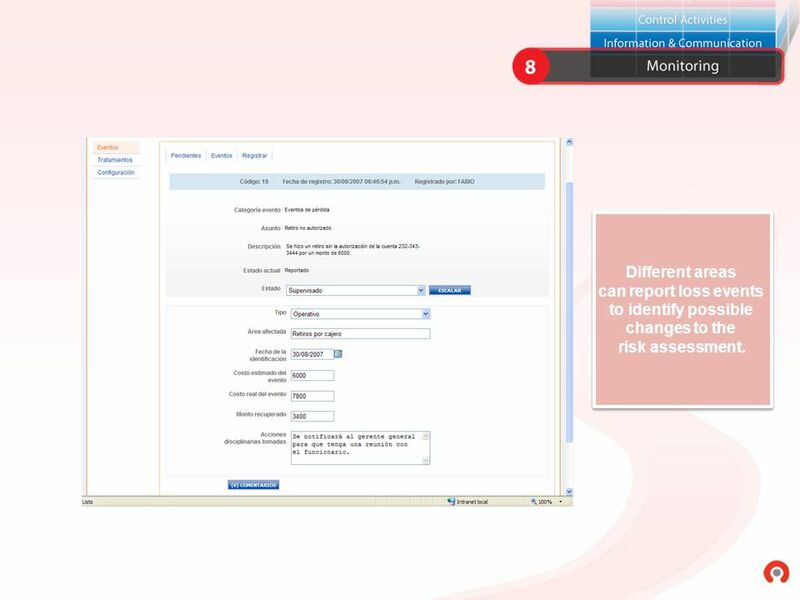 26 Different areas can report loss events to identify possible changes to the risk assessment. 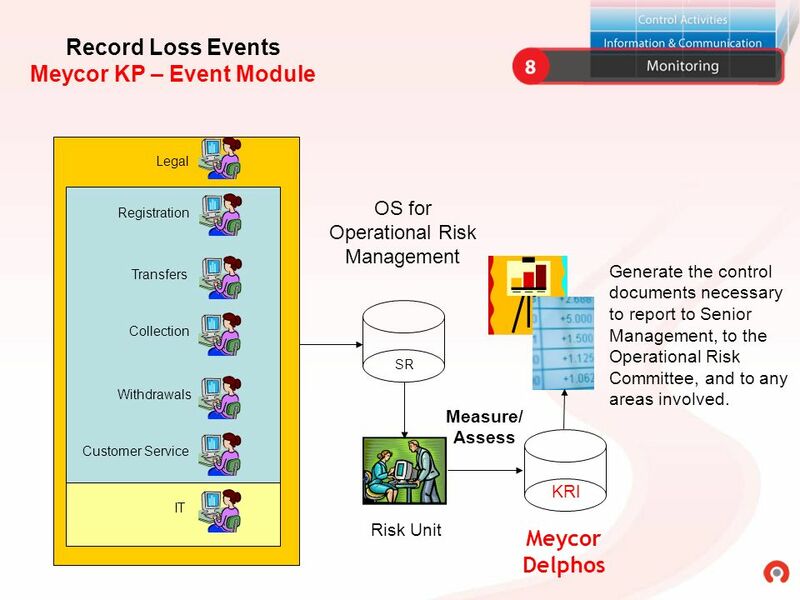 You can define KRI (Key Risk Indicators) that can be populated automatically from the Events Module. 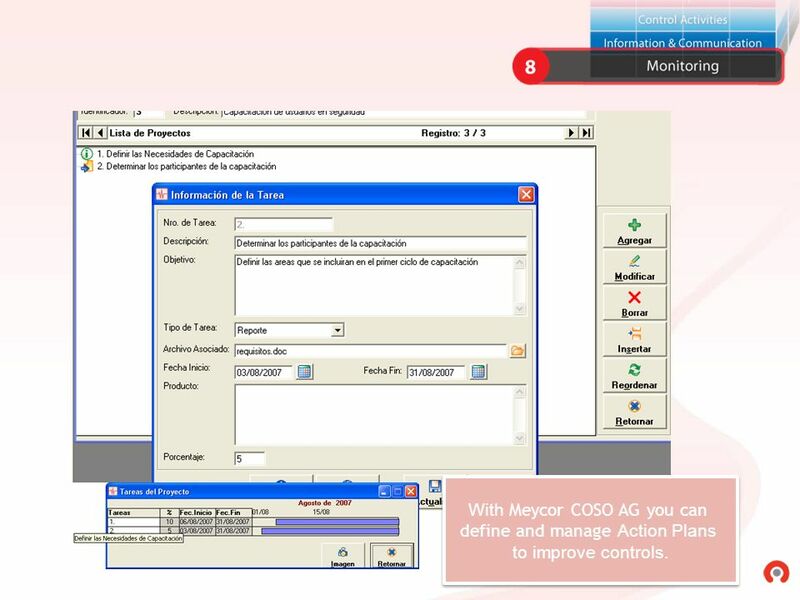 Download ppt "COSO I COSO II. 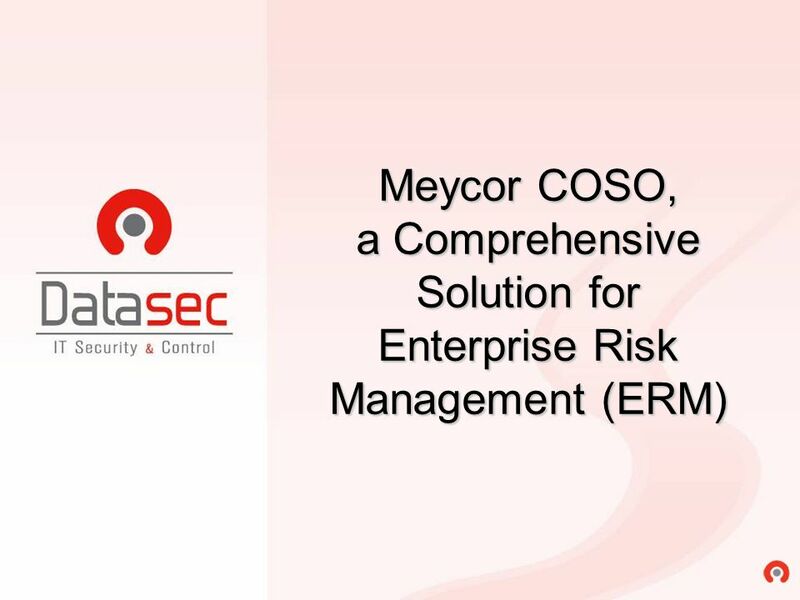 Meycor COSO, a Comprehensive Solution for Enterprise Risk Management (ERM)"
Risk The chance of something happening that will have an impact on objectives. 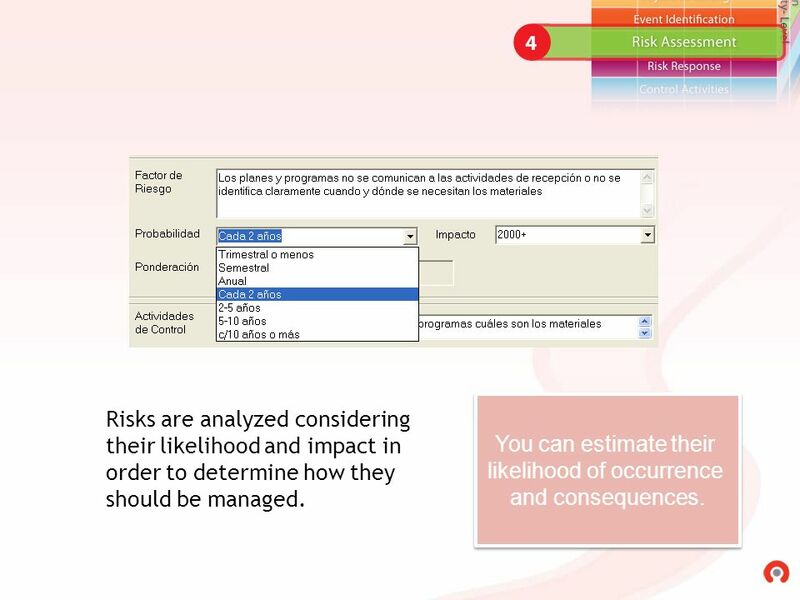 A risk is often specified in terms of an event or circumstance and the consequences. 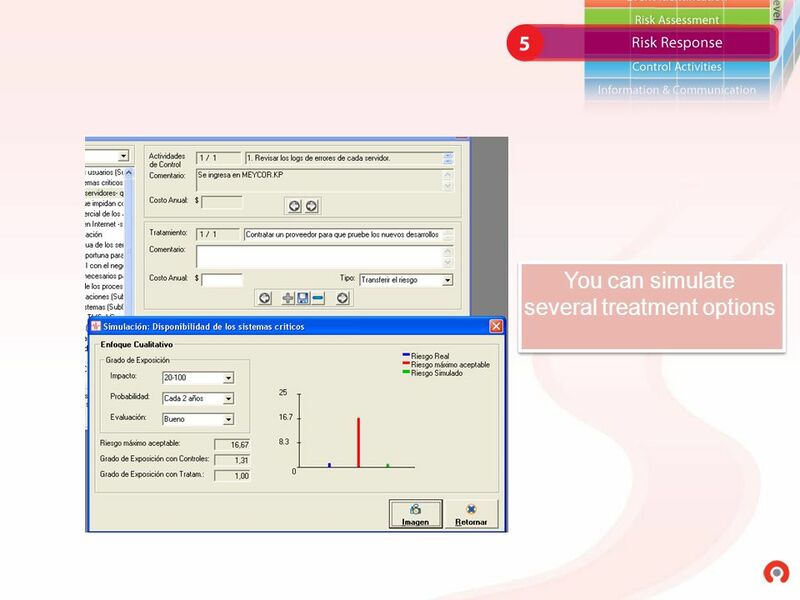 Appendix H: Risk training slides (sample). What is Risk? “ Risk is the effect of uncertainty on objectives ” AS/NZS ISO31000:2009. Tax Risk Management Keeping Up with the Ever-Changing World of Corporate Tax March 27, 2007 Tax Services Bryan Slone March 27, 2007. Service Design – Section 4.5 Service Continuity Management. Eliot M. Stenzel, CPA,CIA IIA Instructor for many years Risk Based Auditing. 1 The Integration of Governance, Risk Management, Compliance and Culture to facilitate the achievement of goals and objectives. Enterprise Risk Management. Operational risk management Margaret Guerquin, FSA, FCIA Canadian Institute of Actuaries 2006 General Meeting Chicago Confidential © 2006 Swiss Re All. RSM McGladrey, Inc. is a member firm of RSM International – an affiliation of separate and independent legal entities. 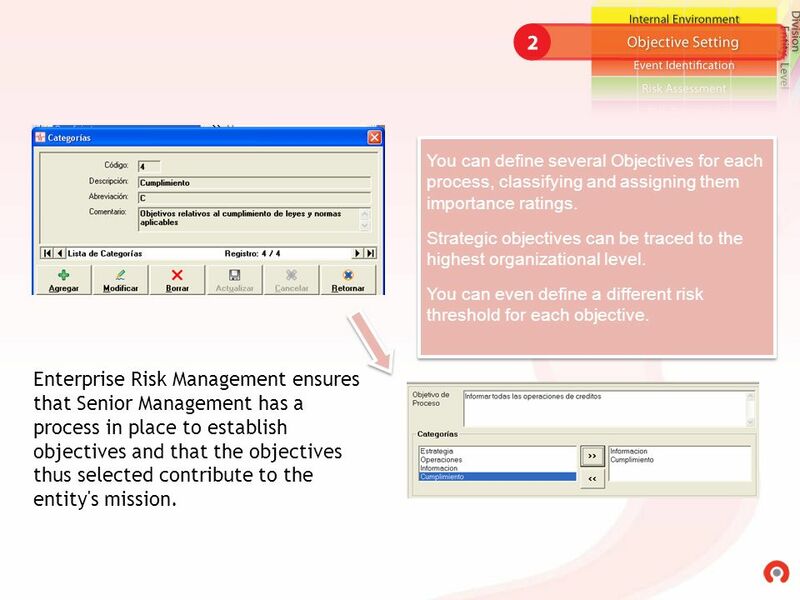 Operational Risk Management Framework. 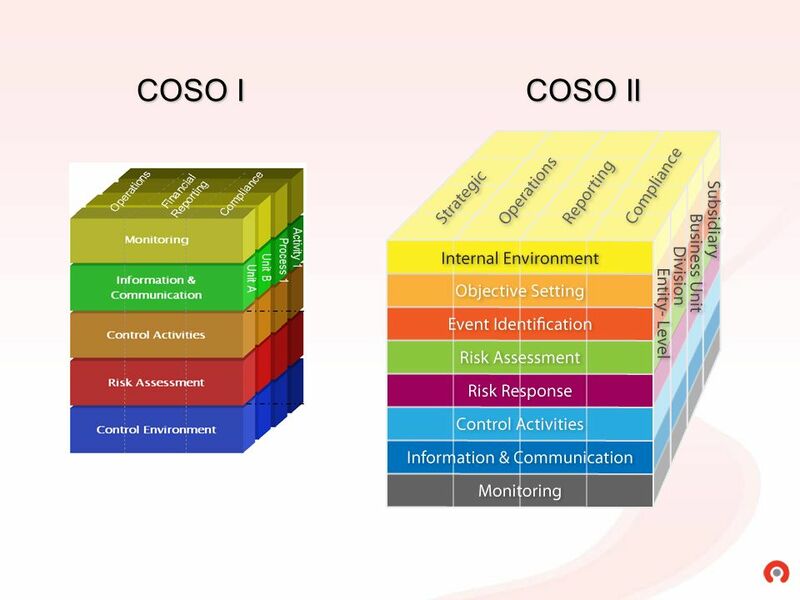 Expanded Version of COSO a presentation by Steve Wadleigh Expanded Version of COSO a presentation by Steve Wadleigh Standards for Internal Control in the. Session 9 & 10. Definition of risk assessment and pre condition for risk assessment Establishment of clear, consistent agency objectives. Risk assessment.